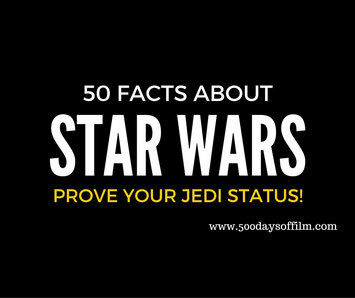 50 Awesome Facts About Star Wars! The time is nearly upon us - we are now hours away from being able to see the most eagerly anticipated film of the year: Star Wars The Force Awakens. These are exciting times indeed. Generations of people will soon descend on their local cinemas to see a film that will (hopefully) secure the future of this amazing franchise. I don’t know about you, but I am getting quite nervous. I have tickets booked for Sunday and it will be a real family affair. I just hope that J.J. Abrams' film can live up to the hype - that it can deliver. I hope that it will be a great cinematic experience. Click Here For More Film Reviews, News And Events! In preparation for this event, I have re-watched the original three Star Wars Films - episodes four, five and six. I now feel ready for episode seven. Bring it on. However, I still have a few tantalizing days ahead. To take my mind off things and make the wait more bearable, I have come up with 50 Fabulous Star Wars Facts. If you know all of these you are a true Jedi indeed! 1. Before falling in love with film, George Lucas had another passion - for cars and motor racing. On 12 June 1962, he was almost killed in a very nasty car accident. 2. Lucas then tried to join the United States Air Force but was turned down because of the amount of speeding tickets that he had accrued. 3. Thankfully, Lucas turned to the movies and Star Wars: A New Hope was released in 1977. 4. Lucas was encouraged to ask for a higher fee for writing and directing Star Wars but, in a genius move, he declined. Instead, he asked for the ownership of the film's merchandising and licensing rights and contractual arrangements for sequels. 5. Darth Vader was played by David Prowse - an English bodybuilder. 6. According to reports, Lucas dismissed the idea of using Prowse’s own voice because of his West Country accent. 7. Lucas originally intended Orson Wells to voice Darth Vader. However, he then felt that Wells’ voice was too recognisable and chose the (then) unrecognisable voice of James Earl Jones instead. 8. In the 2004 documentary, Empire Of Dreams, Carrie Fisher (Princess Leia) explains that the cast and crew nicknamed Prowse “Darth Farmer” because of his accent. 9. Prowse has claimed that he was going to be seen in the helmet removal scene in Return Of The Jedi. Instead, actor Sebastian Shaw was used for that key moment. 10. According to Wikipedia, when Shaw arrived on set to film his short scene, he bumped into his friend, Ian McDiarmid (who plays Emperor Palpatine). McDiarmid asked him what he was doing and Shaw replied: "I don't know, dear boy, I think it's something to do with science-fiction”. 11. Shaw’s scene comprised a mere 24 words, lasted only two minutes and seven seconds and took only one day to film. However, Shaw reported that he received more fan mail and autograph requests for this than any other role in his entire career. 12. When Return Of The Jedi was released on DVD in 2004, Shaw’s eyebrows were digitally removed to match the injuries suffered by Anakin Skywalker at the end of Revenge Of The Sith. 13. R2D2 was portrayed by Kenneth Baker. Baker is 3 feet 8 inches tall. He initially turned down the role as the lovable droid because no one would see his face. 14. Baker was also cast as an Ewok in Return Of The Jedi. 15. Peter Mayhew was cast at first sight as Chewbacca. Mayhew is 7 feet 3 inches tall. He has often joked that to get the iconic role all he had to do was stand up. 16. Lucas wanted an actor who could bring gravitas to the role of Obi-Wan Kenobi. He chose Alec Guinness. Guinness was one of the few actors who believed that Star Wars would be a success. As a result, according to reports, the actor secured a deal for just over 2% of the gross royalties paid to George Lucas. 17. Guinness often struggled with the amount of attention that his role attracted. He later described the films as “fairy tale rubbish” and the script as “banal”. However, the cast and crew have stated that Guinness was inspirational to work with. 18. Peter Cushing was cast as Grand Moff Tarkin: Governor of the Imperial Outland Regions and commander of the Death Star. Lucas originally considered Cushing for the part of Obi-Wan but decided against it. Cushing reportedly stated that he "often wondered what a 'Grand Moff' was. It sounds like something that flew out of a cupboard." 19. Carrie Fisher’s mother, Debbie Reynolds, warned her daughter against taking roles with weird hairstyles. 20. Alongside other film roles, Fisher has become one of Hollywood’s top script doctors - working on the screenplays of other writers. 21. Mark Hamill (Luke Skywalker) was in a car accident whilst filming Star Wars. He fractured his nose and left cheekbone and needed seven hours of surgery. 22. Harrison Ford originally wanted his character, Han Solo, to be killed at the end of Return Of The Jedi (Ford was only under contract to film one sequel). Lucas refused - later, Ford agreed that this was the right decision. 23. The Death Star model was created by English special effects expert, John Stears. Stears won an Academy Award for his work on Star Wars: A New Hope. 24. One of the most sought after Star Wars toys is Lego’s Death Star. This model costs around £275 and has 3803 Lego pieces. 25. On the recommendation of his friend, Steven Spielberg, Lucas asked John Williams to compose the music for Star Wars. 26. Star Wars remains one of the most financially successful films of all time. It was also warmly received by most of the key film critics of the time. 27. Film critic, Roger Ebert, stated that Star Wars was a technical watershed that influenced many of the movies that were later released. 28. Star Wars won six Oscars at the 50th Annual Academy Awards. 29. The Empire Strikes Back was released in 1980 and was directed by Irvin Kershner. Kershner was reluctant to accept the directorial role as he was worried that a sequel could never match the success of the original. 30. Many people believe that the moment in Empire where Vader admits to being Luke’s father was conceived after the first film was released. 31. No one knew about the revelation, including the actors involved until just before the scene was shot. 32. Make-up artist, Stuart Freeborn used his own face when designing Yoda. He then added the wrinkles of Albert Einstein. Freeborn also created Chewbacca’s look. 34. Frank Oz provided Yoda’s voice and was the character’s key puppeteer. Actors Deep Roy and Warwick Davies both played Yoda in some walking scenes. 35. Empire received mixed reviews at first but has since become one of the most critically acclaimed films of the franchise. 36. Return Of The Jedi was released in 1983 and was directed by Richard Marquand. 37. Lucas had also approached David Lynch and David Cronenburg to direct the film. 38. Return Of The Jedi was the first film to use Lucas’ THX technology. 39. Return Of The Jedi was almost called Revenge Of The Jedi. However, Lucas felt that Jedi’s would not want revenge. 40. Star Wars Episode 1: The Phantom Menace was released in 1999 and was written and directed by Lucas. It was not well received by critics and has a 56% Rotten Tomato rating. However, the film was a huge financial success. 41. Ewan McGregor plays the younger Obi-Wan - he had a vocal coach to make his voice sound more like Alec Guinness. 42. The Phantom Menace introduced the world to Jar Jar Binks - one of the most hated of all Star Wars characters. 43. Star Wars Episode 2: Attack Of The Clones was released in 2002. It received more favourable reviews than Episode 1 but was still criticised for being overly heavy with plot exposition and clique. 44. In Attack Of The Clones, we see Palpatine's rise to power. Lucas has noted that this development is very similar to that of Adolf Hitler in Nazi Germany. 45. Star Wars Episode 2: Revenge Of The Sith was released in 2005. 46. Ewan McGregor and Hayden Christensen (Anakin Skywalker) rehearsed their epic light-saber fight for weeks before filming. They were trained by Nick Gillard, an English stuntman and coordinator. Gillard has a minor role in Revenge Of The Sith. He plays a character cunningly called Cin Drallig. 47. In 2012, George Lucas decided to pass his Star Wars franchise on to other filmmakers. He then sold Lucasfilm to Disney for $4.05bn ($2.5bn). 48. Disney soon announced that it planned to release a new Star Wars film in 2015, followed by another two films - one every two years. 49. On 25 January 2013, J.J. Abrams was announced as the director and producer of the first new film: Star Wars The Force Awakens. 50. Construction on a Star Wars Land at Walt Disney World’s Hollywood Studios and Disneyland, is expected to begin in 2016. How many of these facts did you know? I certainly feel like a proper Jedi now… and am even more excited to see the next installment! Are you? Let me know in the comments section below!